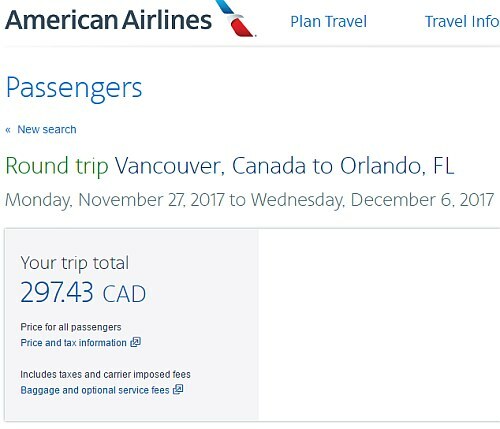 WestJet and American Airlines have dropped the price of some of their November and December flights from Vancouver to Orlando, Florida down to $297 CAD roundtrip including taxes. The flights have 1 stop each way. The flights are operated by WestJet on the way down to Orlando, and by American Airlines on the way home. Aug 29, 30, 31 to Sep 6, 7 -- new! Sep 2, 3 to Sep 7 -- new! Sep 7 to Sep 14, 16, 17, 18, 19 -- new! Sep 18, 19, 20, 21 to Sep 21, 22, 26, 27, 28 -- new! Sep 25, 26, 27, 28 to Oct 3, 4, 6 -- new! 3. Select your flights in Google Flights and click through to the the American Airlines website for booking. Update 8/30 - There are a couple of new dates available in November from Vancouver to Orlando, Florida for $281 CAD roundtrip including taxes. These flights have 1 stop on the way there, but are non-stop on the way home. The price will show up as $219 USD roundtrip including taxes, which will work out to $281 CAD when booked using a Canadian credit card, and including the typical credit card foreign exchange fee. This will work out to $271 CAD roundtrip when booked using a Canadian credit card, and including the typical credit card foreign exchange fee. 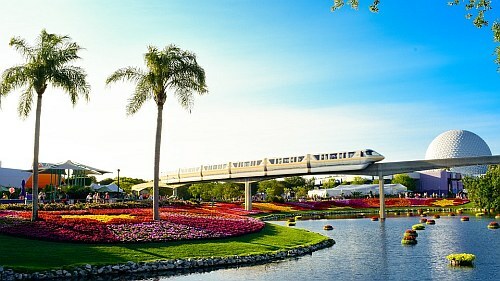 vancouver, yvr, flight deals, westjet, american airlines, florida, orlando, mco, united states and north america.